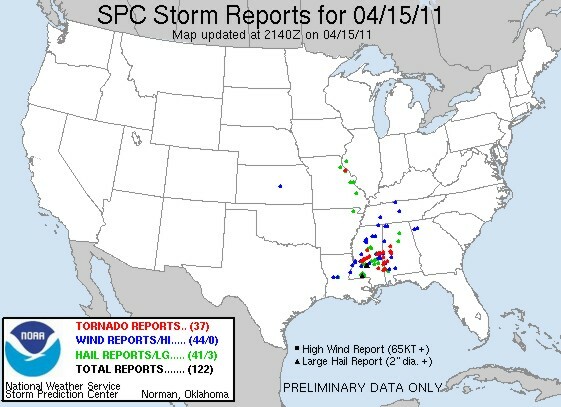 Storm reports from the SPC on April 15, 2011 as of 4:30 p.m. CT. So far today, there have been 36 tornado reports across central/southern Mississippi and Alabama. Both regions are largely unchaseable IMO, with the exception of parts of western Mississippi. There, the terrain is flat due to the flat plain surrounding the Mississippi River. Anyways, on a day like today when destructive tornadoes are ripping through Jackson, MS and Tuscaloosa, AL, you wouldn’t really expect to see much tornado footage from storm chasers. But today through Facebook I was able to instantly view spectacular video of the tornado moving through Jackson, MS.
It’s just amazing to me, as someone who began chasing during a time when a chaser had to rely upon a nowcaster and internet at public libraries to get radar and satellite data during a chase, to see a group of storm chasers get amazing video of a violent tornado and have it online within minutes! The sad part is I don’t even know who actually shot the video! But that’s beside the point. It seems to me that a large portion of the chasing community has grown into a new generation that is all about instant gratification. New chasers seem to work pretty hard to get their video online as quickly as possible. This is saturating the tornado video market as a lot of times these chasers unknowingly are either giving their video away, or are selling it for much less than it’s actually worth. For the record, the video from Jackson that I already viewed for free on Facebook and Youtube would be worth a lot of money. At the risk of sounding like a crotchety old man, I find this evolution in storm chasing to be quite unsettling. A lot of new chasers and soon-to-be-chasers probably think you can just drive out to the plains and get right up next to a massive tornado with little effort. And why wouldn’t they think that? Amazing videos like the one I saw today are accessible instantly online while storms are ongoing, and sometimes the video is available live. This is only because there are literally several hundreds of chasers out during every severe setup nowadays. So from probabilities alone, somebody WILL get video of the tornado, leaving dozens or even hundreds of chasers with nothing to show from their day. Things have certainly changed since I began chasing over a decade ago. Ok, I’m done ranting. My thoughts go out to the people in Jackson, MS.
It’s been an active April thus far across parts of the Plains and Midwest, and it appears likely that trend will continue tomorrow (Thursday). 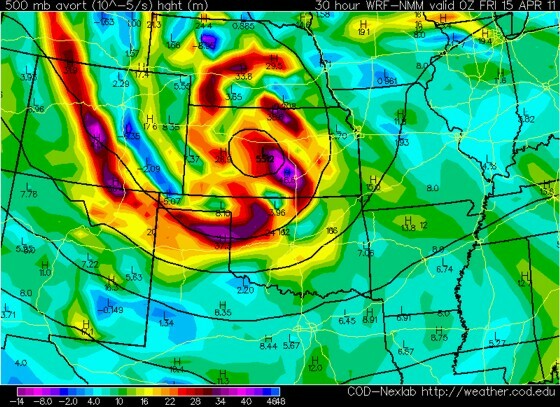 A vigorous 500mb shortwave trough will eject into the southern plains on Thursday. As a result, a surface low will develop over central Kansas, with a cold front diving south and east into west central Oklahoma by the early evening hours. A dryline will also mix east to near the I-35 corridor along the Red River and portions of south central Oklahoma. These two boundaries will be focal points for thunderstorm initiation in the late afternoon, as intense dynamic forcing from the upper air trough cools the mid level capping inversion. This will allow for thunderstorms to form, from the Red River northward to central Kansas, along the north-south oriented boundary. Dewpoints in the upper 50s to mid 60s will spread rapidly northward across central/eastern Oklahoma and even parts of southern Kansas by 00z. Strong, deep layer shear in addition to generally southerly 850mb winds in the 30-40 knot range will contribute to curved hodographs and sufficient low level SRH values supportive of tornadic supercells. Based on the 12z WRF, hodographs IMO look better for long track, violent tornadoes across the eastern half of Oklahoma as opposed to further north in Kansas. However, I think tornadoes will likely occur in both areas. But Oklahoma may stand a better chance at seeing a long track, violent tornado. Storm motions will be more northerly across eastern Kansas, and hodographs there just don’t look quite as good as in Oklahoma. In addition, I wouldn’t be too excited about storms moving north tomorrow in Kansas, since they’d be moving away from the good moisture and CAPE. Thus, in general, I’d rather be in central/eastern Oklahoma. Finally, the terrain is pretty good north of I-44 and east of I-35, so that would be my general target region for tomorrow. 12z April 13 WRF model forecasting hogograph for Tulsa, OK valid 00z 15 April. 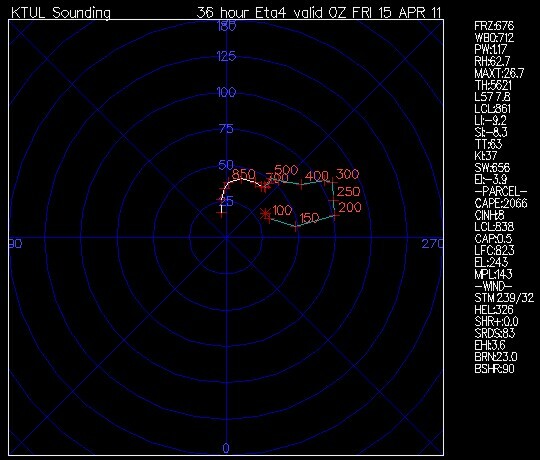 This a pretty good hodograph that is indicative of strong and potentially long track tornadoes, as long as the storm motion is generally to the northeast or east-northeast. My greatest concern for this setup is the fact that there will be so much dynamical forcing in the upper levels from not only intense vorticity advection at 500mb, but also from the 250mb curved jet streak. 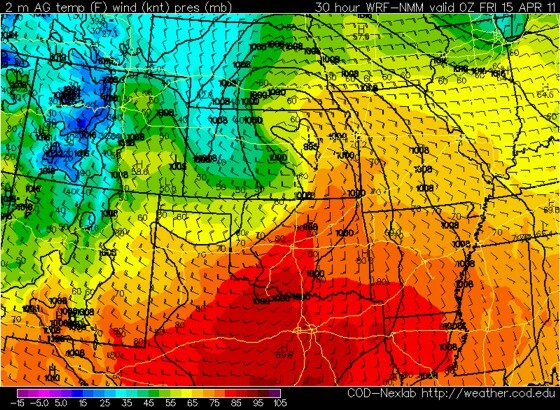 So even with quite warm 850mb temps by midday across central/southern OK (16 to 20C), the forcing will easily cool that. Thus, I’m concerned there will be numerous cells that fire quickly as the all the dynamics move into the KS/OK region. And given CAPE values are only forecast to be in the 1500 to 2000 J/KG range, storms may compete with one another for moisture and/or instability. But I’m not sure, because the shear could make up for the lack of substantial CAPE. We’ll see. Good luck to anyone chasing out there tomorrow! 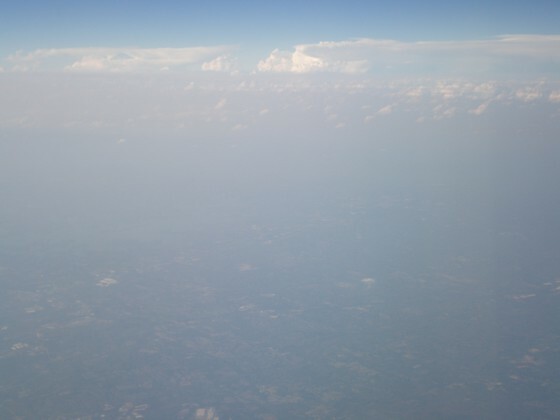 Supercells in Charlotte, NC shot from a plane! I’ve been extremely busy over the past week or so, and haven’t been able to comment on the tornado outbreaks that have been occurring over the Great Plains. Although, I will say the MJO wave came through like a charm, and contributed to three straight days of supercells and tornadoes. So while I’ve been too busy to follow the tornado outbreaks that occurred, I can at least share some pretty cool pictures I shot from a plane near Charlotte, NC. On Saturday, April 9, I was flying into Charlotte, NC to catch my connector into LGA later that evening. 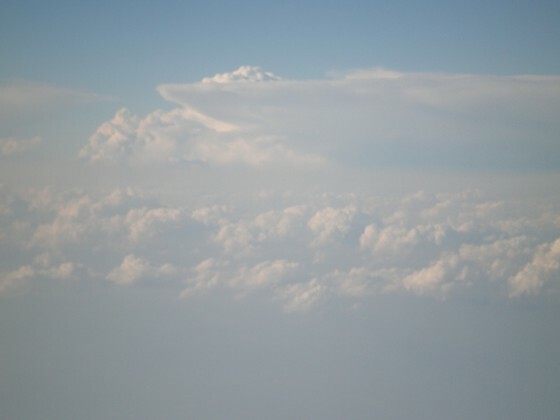 A couple hours into the flight, I looked out the window and noticed intense updrafts and thunderstorm tops off in the distance. I shot some photos with my digital camera, and then sat back into my seat and relaxed. A few minutes later, I noticed a much more impressive updraft and overshooting top. 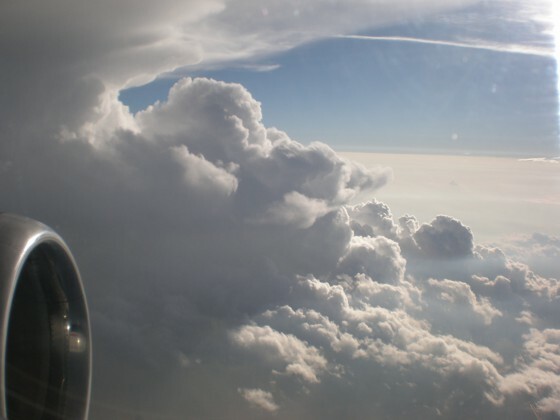 Finally, as we began our initial decent into Charlotte, I snapped an incredible picture of the updraft and anvil of a supercell that, evidently, caused us to not only circle the airport for 30 minutes, but then get re-directed to Columbia, SC! 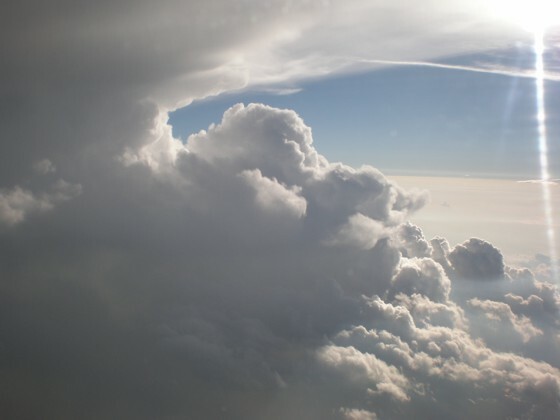 Supercell just north of the plane, with a visible anvil. This was the reason for our re-direct into Columbia, SC. I don’t want to bore everyone with the details, so I’ll make the rest of the story short. We sat on the plane in Columbia for almost three hours before finally taking off again to Charlotte. When we arrived, I was certain I’d missed my plane. 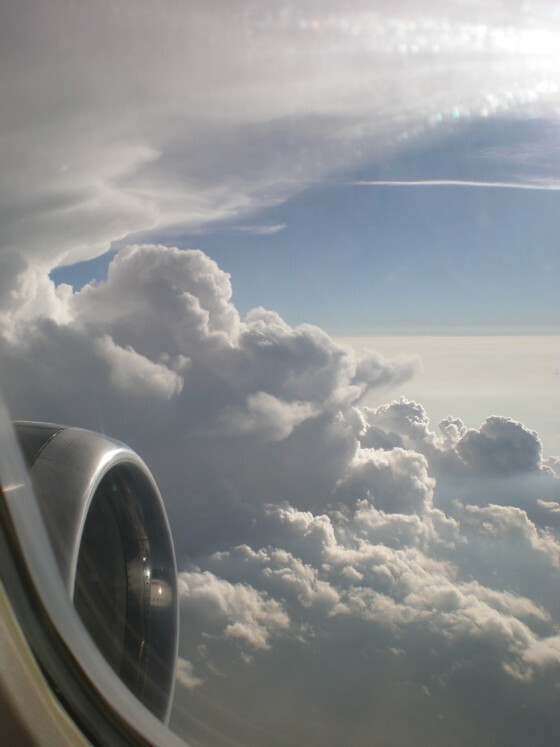 But all flights were delayed due to the storms. To cut to the chase, my flight didn’t leave the airport ’till 1:30 a.m., and I didn’t get home until around 4:30 a.m.! So I was basically in travel mode for twenty hours, between different airports and on three different airplane. But, at least I made it home in one piece without having to figure out an alternative plan of action. 12z 2 April GFS run valid 00z Fri, 8 April, showing a Pacific jet extension into the northeast Pacific with a deep trough entering the southwestern U.S.
We are starting to get into the time of year when severe storm/chase setups become more common across the plains. 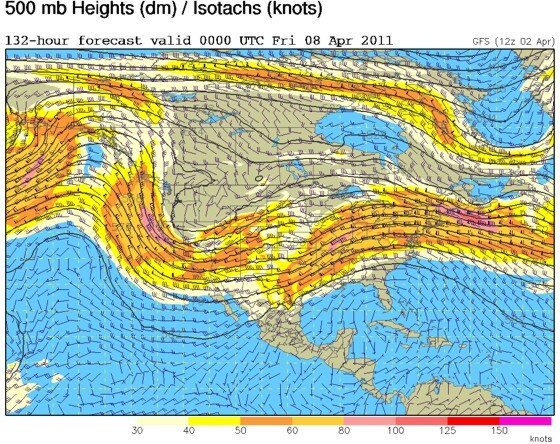 From what I’m seeing there should be a pretty good jet stream extension across the northeastern Pacific over the next few days, which will result in a significant trough to dig into the western states and eject into the plains mid to late this coming week. With adequate moisture already available in the Gulf, there should be at least two to three chase setups leading up to the main trough, and of course as the trough ejects through the plains. There a few different reasons for the pattern becoming more conducive for severe setups. The first is the MJO, which has been moving swiftly eastward across the Indonesia region over the past week. 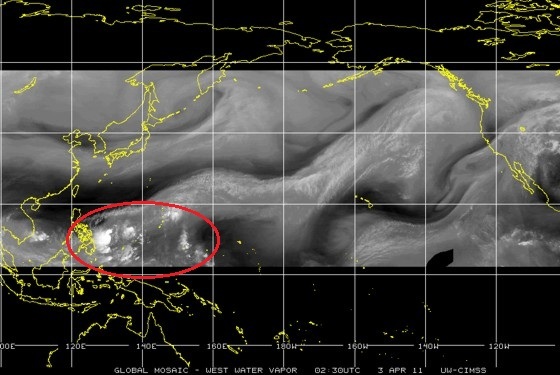 It is now making it’s way towards the western Pacific, and the tropical convection associated with this wave is feeding into the Pacific jet. You can see this in the waver vapor image (below). Over the next few days, the MJO will help to extend the Pacific jet (briefly) into the Gulf of Alaska and extreme western Canada. This will force a deep trough into the southwestern U.S. and help set the stage for severe storm setups later this week over the southern plains. Water vapor image valid April 2, 2011 EDT. Below is the PNA from the CPC website. Usually, when there is a ridge over the western states the PNA is positive, and when there is a trough over the western states the PNA is negative. As you can see, all the GFS Ensemble members are forecasting the PNA to return to a negative phase after being positive throughout the entire month of March. This is a good sign that Pacific energy will dig into the western states and then eject eastward through the plains over the coming week or so. There are a couple other things going on, but I don’t really want to spend anymore time analyzing the reasons why the pattern is going to behave. Let’s just say a lot of things are going on right now. Having said all of the above, the computer models are showing a few different potential severe storm/chase setups mid to late this upcoming week through the weekend, from Texas and Oklahoma into Kansas, Nebraska and Missouri. I could go through each setup individually, but that would not only take a long time, but also be rather fruitless at this juncture. We are still several days away from these potential setups and the models need time to get a better handle of the immense amount of energy coming out of the Pacific. But I will say this — the CAP is likely to be a big problem on the days leading up to main shortwave before any significant upper air support is available. 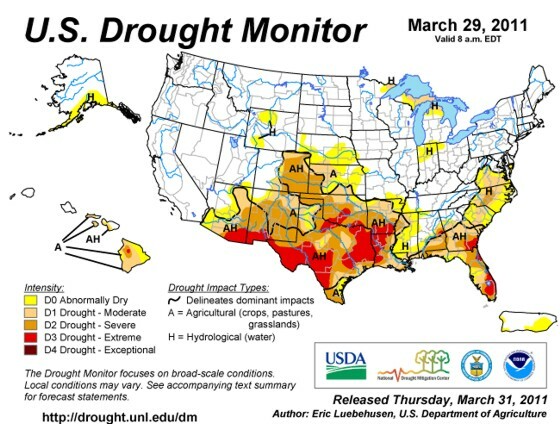 Below is the U.S. drought monitor valid March 29, 2011. Notice all of the southern plains and parts of the southwestern U.S. are in a severe drought. Some areas — including parts of Texas and Oklahoma — are in an extreme drought. Notice the extreme drought covers southwest Texas and southern New Mexico. All this does is create a breading ground for an enormous capping inversion (‘CAP’), or for the meteorologists reading this, a substantial elevated mixed layer. In order for a strong CAP to be broken, you need good daytime heating with either substantial low level moisture or adequate upper air forcing. U.S. drought monitor valid March 29, 2011. 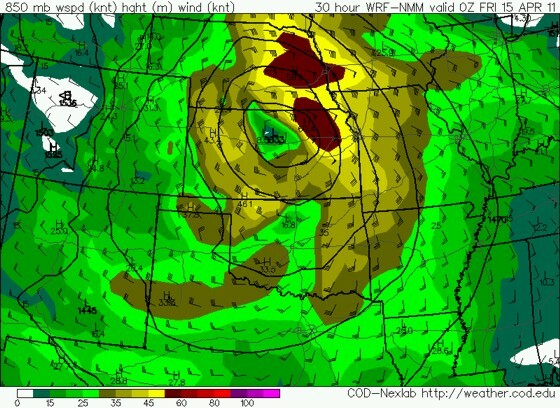 I will say that the GFS is forecasting a strong 850mb jet on both Friday and Saturday (below). But on Friday there won’t be much, if any, upper air support because the main trough will still be over the interior West. But by Saturday, the main trough will be ejecting through the southern plains, so that could be the main event. But again it’s too early to talk details since the timing of this main trough is still a bit uncertain. 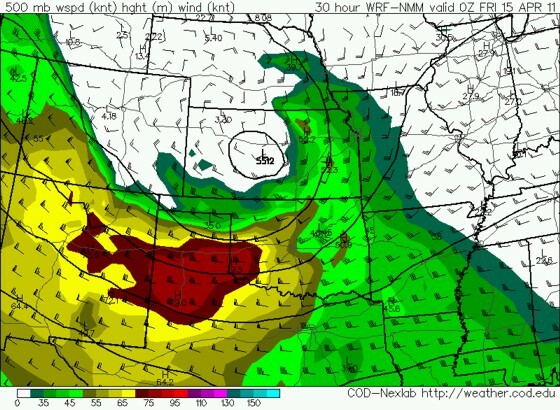 I think every setup should be analyzed closely over the next week for any potential supercell and tornado risks across the southern and even central plains. 12z 2 April GFS 850mb winds valid Friday 8 April. 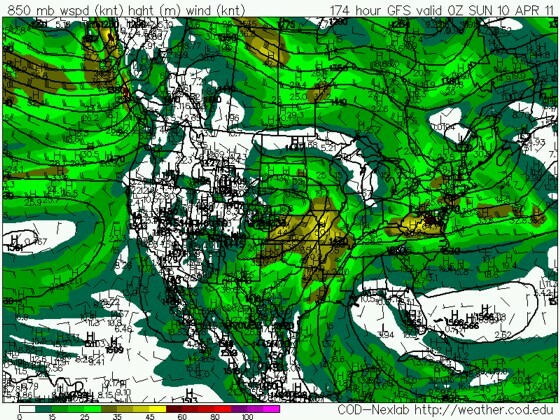 12z 2 April GFS 850mb winds valid Saturday 9 April.